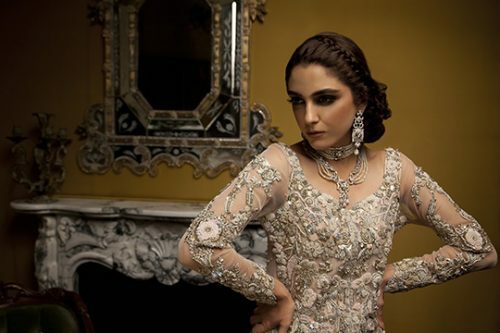 Ammara Khan Luxury Bridal Dresses have been launched and it has all the traditional luxury dresses that Pakistani brides need to wear during this wedding season. 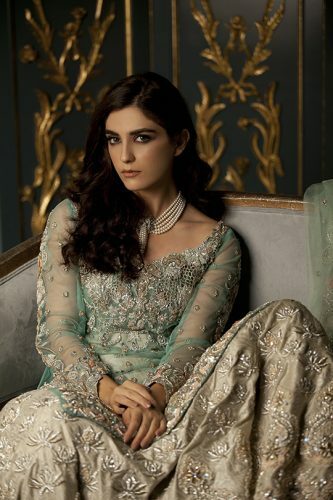 Ammara Khan is known for hand embroidery bridal dresses her latest collection is available in the market as Giglio Bridal Collection.You will see a lot of handmade embellishments on all dresses each dress is different in this collection which can be worn on different events of the wedding ceremony. 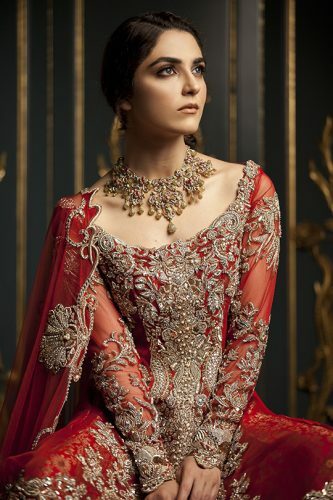 Color choice of these wedding dresses is matched with embroidered and embellishment work that you are seeing on each dress.The main color scheme is light which reflects the colors of winter and spring season this collection is fabricated inside warm fabrics so you can feel comfortable during the winter wedding time. 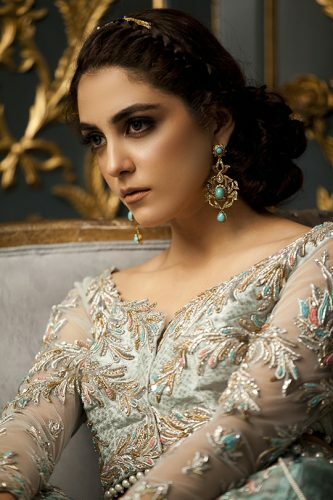 Mint green color dress is very eye catchy you can wear it on your Walima ceremony or some other wedding party you are going to attend your wedding ceremony.Besides light color dresses, this collection also has red Baraat event dress which you can choose for your Baraat ceremony. 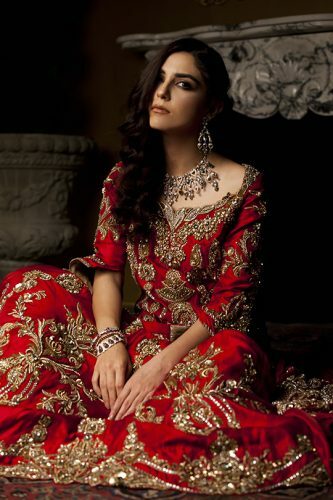 It includes all the designs you just need to adjust your hairstyle and wear the bridal shoes with them another style will be provided to you by your wedding dress.Dress designs are classic and modern some are traditional lehenga type dresses and some are gowns. 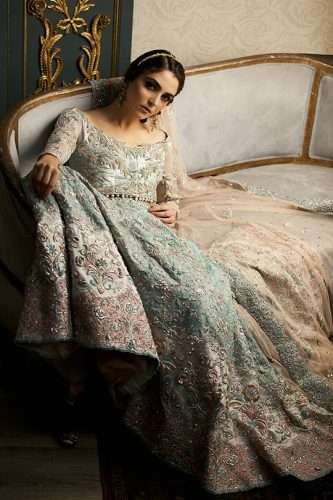 Some dresses are for after wedding parties like a 3 pcs suit in this collection it has all the embellishments of a wedding dress but the design is of parties and events that new bride has to attend after her wedding. 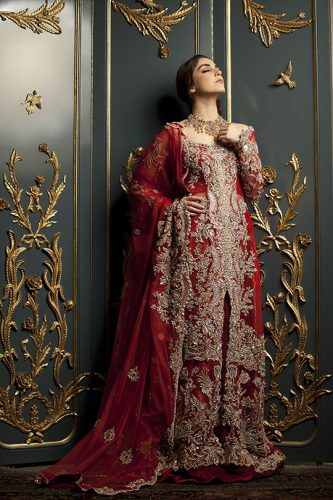 You will see different crafts work on various fabrics in this one collection which is luxury and glamorous in every field of bridal traditional fashion. These dresses are available on Ammara Khan Facebook Page now let’s view the complete gallery of Ammara Khan Luxury Bridal Dresses.